The ideal planting time for fruit or nut trees is during the dormancy period in the bare-root stage during winter or early spring. Plant as soon as possible after receiving them from the nursery, and do not let them dry out. The roots are very sensitive and must be kept wet and protected from harsh temperatures. Pack roots in peat moss or similar material and keep plants in cool, shady locations until ready to plant. Avoid planting in a hole or a low-lying area to prevent diseases such as root rot. Plant in raised beds, or on a ridge or mound of soil several inches high and several feet across in areas where drainage is poor or soil is highly amended. Plants will settle as organic matter in the soil decomposes. The hole should be about 1.5 to 2 feet wide and about 1.5 feet deep. When you are ready to plant, remove the packing from the root system and examine the roots. 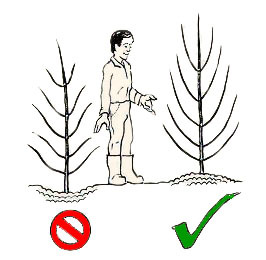 Cleanly remove broken or decayed roots prior to planting. Soak the roots in cool water for about 6 to 12 hours and then place the tree in the hole, being careful to spread out the roots. When planting, make sure all the roots are in their natural position. Avoid curling them around the planting area. Refill the hole with the original soil from the site and avoid adding organic amendments and fertilizers. While refilling the hole, settle the soil around the roots to avoid air pockets. Leave the graft union 2 inches above the soil line. Water in after planting. Fertilizer is not usually necessary the first year.